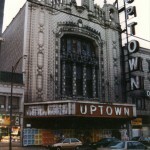 The Uptown Theatre opened its doors August 18, 1925, billed as “An Acre of Seats in a Magic City.” The Uptown Theatre, also known as the Balaban and Katz Uptown Theatre, is a massive, ornate movie palace in the Uptown neighborhood of Chicago, Illinois. 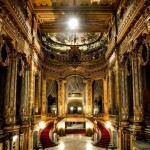 Designed by George W. Rapp and Cornelius Rapp (the architects who were largely responsible for popularizing the motion picture palace) and constructed in 1925, it the last of the “big three” movie palaces built by the Balaban & Katz theatre chain run by A. J. Balaban, his brother Barney Balaban and their partner Sam Katz. 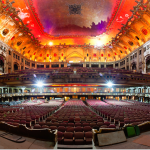 The largest in Chicago, it boasts 4,381 seats and its interior volume is said to be larger than any other movie palace in the United States, including Radio City Music Hall in New York. It occupies over 46,000 square feet (4,300 m2) of land at the corner of Lawrence Avenue and Broadway in Chicago’s Uptown Entertainment District. 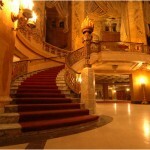 The mammoth theater has an ornate five story entrance lobby with an eight story façade. The Spanish Revival style design was loosely derived from Spanish Baroque architecture. A local group of theatre enthusiasts, Friends of the Uptown, have been raising money to increase awareness of this community asset and the needed restoration efforts. 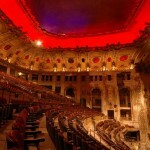 Preliminary options for the theatre’s renovations have been made since the 1990’s, but it continues to sit abandoned. In 2006, the exterior was extensively secured and terra cotta pieces were cataloged and stored for future restoration efforts. It is estimated it will take about $40 million to get it ready for use again. Images courtesy of Bob Bullen (www.chitheatreaddict.com) and Eric Holubow. Description courtesy of Wikipedia. PA/PM work completed by Brian Rich at Daniel P. Coffey & Associates, Ltd.